Tata Motors has always remained when it comes to serving the society. And in the latest, with an aim to partner with the community, Tata Motors announced a national level School Bus Safety program, targeting all stake holders involved in School Bus travel. Through the School Bus Safety program, Tata Motors aims at sensitising school children, their parents, drivers, attendants and school bus staff, to prevent and minimise accidents during travel. As part of the School Bus Safety campaign, Tata Motors has initiated the ‘Hamare Bus Ki Baat Hai’ (for school bus attendees),‘Safety Hamaare Bus Mein’ (Mock drills on safety measures in case of a fire & safe school bus travel, for children) and ‘Dream it to Win it’ (national level essay & painting competition, for children). 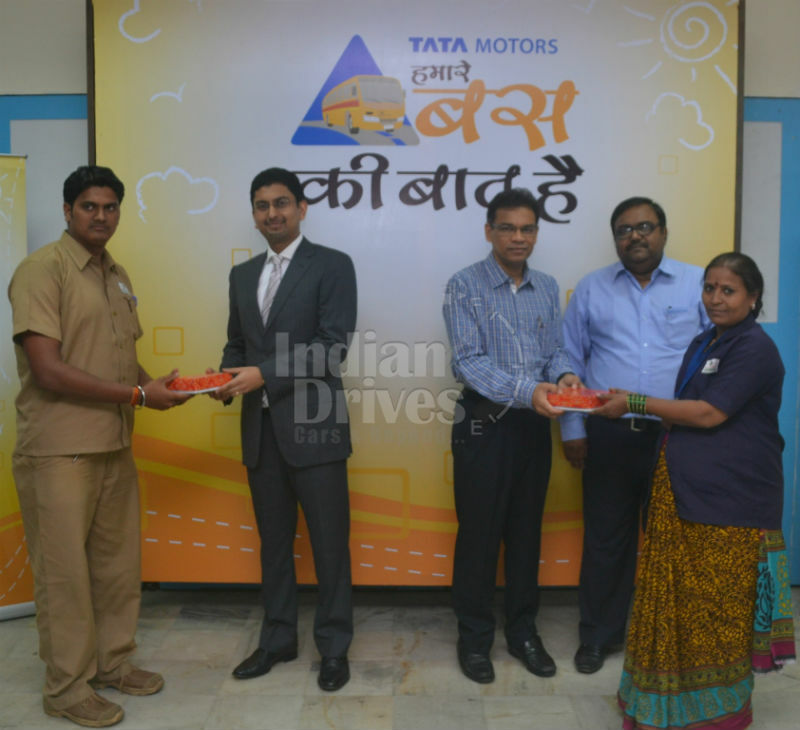 Tata Motors today conducted the ‘Hamare Bus Ki Baat Hai’ program, at Podar International School, Santacruz, Mumbai. The ‘Hamare Bus Ki Baat Hai’ program targets school bus drivers and attendants, educating them on the softer aspects of interacting with children and parents. The interactive training programme has been designed with inputs from various stake holders, sensitising participants to better understand a child’s needs, creating awareness about their duties and responsibilities, general etiquette & behavior, and to take necessary measures in case of accidents. ‘Safety Hamaare Bus Mein’ programme is designed to educate school children on using safety features in buses, tips on safe travel and other softer aspects of dealing with school bus staff. The training includes aspects like mock fire drill in schools, a virtual experience film showing safe travel, sessions with select students on safety and a safety quiz in school. It involves safety drills like entry/exit, emergency evacuation, and effective handling of safety provisions in a bus. This campaign is set to kick-off shortly. “Dream it to Win it” contest received participation of over 3,000 schools in a national level essay & painting competition. The contest helped in showcasing the talent of children and enhancing their awareness levels, on the importance of safe school bus travel. Though this program, children were felicitated with certificates, scholarships and exciting gifts. Apart from these technology rich features, Tata Motors SKOOL buses are also fitted with comfortable seating, chin guard, stop sign on passenger door, 2-point lap seat belts, one row roof grab rail handles, fire extinguishers, rear high mount stop lamp, rear breakable windshield with hammer.